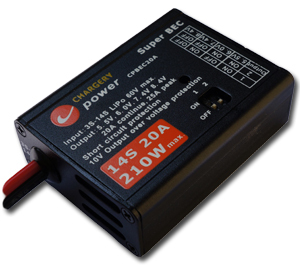 Chargery Super BEC is the most powerful Battery Eliminator Circuit in RC industry, it can handle high voltages and withstand incredible high current loads of 20Amps continuous in so small space. 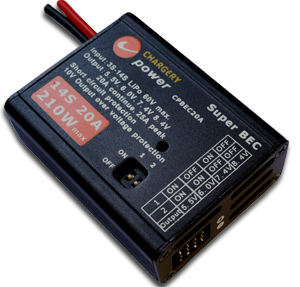 Chargery Super BEC is a glitch free high efficiency, high power switching voltage regulator designed to work with all popular brands of 2.4 GHz R/C receivers and servos. It provides safe and consistent power to your R/C receiver and servo(s) that eliminates the need for a separate battery source. over-temperature protection enhance system reliability. Chargery Super BEC will boost performance on your R/C model by reducing the overall weight while maintaining a high current output from high voltage sources up to a 14S LiPo battery (58.8V). The Chargery SUPER BEC is ideal for today’s more demanding R/C aircrafts equipped with digital servos that require even higher current demands without sacrificing with additional weight. Input battery range: 3S-14S LiPo battery pack or DC9-60V. Ouput voltage: DC 5.5V, 6.0V, 7.4V, 8.4V adjustable. Output wire: 4 output port, 20 AWG silicon glue wire 300mm legth. The BEC offers high power, small size and incredible flexibility to all who wish to power their receivers and servos directly with the motor batteries. The BEC takes input voltage up to 25V (6S) and steps it down to a user-selectable voltage, and withstand high current loads of 10Amps continuous. The Chargery BEC is a glitch free high efficiency, high power switching voltage regulator designed to work with all popular brands of 2.4 GHz R/C receivers and servos. It provides safe and consistent power to your R/C receiver and servo(s) that eliminates the need for a separate battery source. The Chargery BEC will boost performance on your R/C model by reducing the overall weight while maintaining a high current output from high voltage sources up to a 6S LiPo battery (25.2V). It is ideal for today’s more demanding R/C aircrafts equipped with digital servos that require even higher current demands without sacrificing with additional weight. Input battery range: 2S-6S LiPo battery pack or DC6.5 -25.2V. Ouput voltage: DC 5.4V, 5.9V, 7.4V, 8.4V adjustable. Output wire: 20 AWG silicon glue wire 300mm legth.